This paper describes the major responsibilities of conservators in maintaining collections of Asian hanging scrolls, hand scrolls, folding screens and sliding screens. The paper is aimed at Western paper conservators who may be called upon to perform the conservation of Asian paper art objects. These conservators are often asked for advice on climate control and the examination of Asian art objects. They may also be called upon to perform minor treatment: mending tears, consolidating flaking paint, etc. Such requests are likely to continue to be common. It is hoped that this paper can help Western paper conservators understand typical conditions of deterioration of Asian paintings and how these works may be examined. East Asian Paintings such as Chinese, Japanese and Korean paintings, are normally painted on silk or paper. I am not including wall or wooden panel paintings. Silk and paper paintings come in special formats. Basically there are three forms: Scrolls (kakemono, hanging scrolls and makimono, hand scrolls); screens (byobu, folding screens and fusuma, sliding screens); and book formats (album leaves and book bindings), which are similar to Western matted paper objects or book bindings. Therefore, I will not include album leaves or book formats in this paper. There are various forms for different purposes, including condition surveys for the collection which contains treatment priorities and curatorial evaluation; examination for the consideration for new acquisition; examination for loans and exhibitions; and examination prior to treatment either in house or contracted out. Sometimes, scholars and collectors immediately want to hang the scrolls on a wall without knowing the condition of the scroll or its painted content. This can be dangerous. The string must be strong enough to hold the weight of the scroll. Kan or metal loops must be securely inserted into the top rod for the hanging scrolls. The knobs must be well attached to the scroll, because one will be holding the hanging scroll by the knobs when it is rolled and unrolled. a. fragments of both support and pigments do not fall. b. as you unroll the scroll, it is more controllable and easy to stop at anytime if a problem appears. c. weights can be placed to hold broken supports. d. Raking light is easily illuminated from any direction. e. It is easier to perform temporary treatment this way since the scroll does not move. If the screens are in stable condition, without flaking paint or broken hinges, one might like to locate the screen in an upright position, but if the hinges of the folding screens are broken or weak or the paint layer no longer adheres to the support paper, I normally open the folding screen laid flat on a table with blocks underneath to raise both sections level. Edges near the hinges must be supported by hand as the screen is opened, preferably with two hands by two people if the hinges are very weak. I often open the screen, two panels at a time, so that I can reach the center of the painting easily. The most common form of deterioration for scrolls is creases or cracks from rolling. That is one of the reasons why many of the Japanese, Chinese and Tibetan Thangkas in this country have earlier been remounted on panels. When a scroll is rolled, the outside layer stretches and the inside layer is compressed. This compression may cause the scroll to crease. Also, when the scroll is rolled for a long time, both the inside layer and outside layer tend to stay somewhat curled. Then when the scroll is unrolled, the back side of the scroll is compressed. The reverse compression also causes creases. Repetition of this action causes the surface to break and the weak areas start to develop cracks, creases and severe ridges. Therefore, thinner paper for use in backing to make scrolls is better, but thinner paper presents different problems: not enough rigid support for the painting as with thicker scrolls. Normally Chinese paper is very smooth, but because, it has shorter fibers than the Japanese kozo papers, once weak areas start creasing, all the forces are concentrated at these areas. This causes more severe creases. Once cracks or creases occur, fibers break, and the creases progress into serious ridges. Stiffness of the scroll from the adhesive used for mounting is another cause of the fibers losing flexibility and breaking. Because the edges of the creases are higher, they get abraded more by rubbing against the back of the scroll, when it is rolled up. Creases also occur from the edges of the reinforcement strips added in the previous restoration. 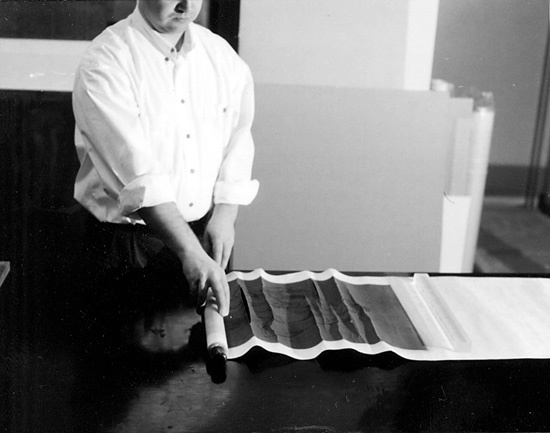 Horizontal creases of hand scrolls occur from improper handling, such as a hand squeezing the scroll as it is unrolled. Traction cracks on the paper support occur from a heavy concentration of coating, such as dosa (alum/animal gelatin sizing) on the surface. 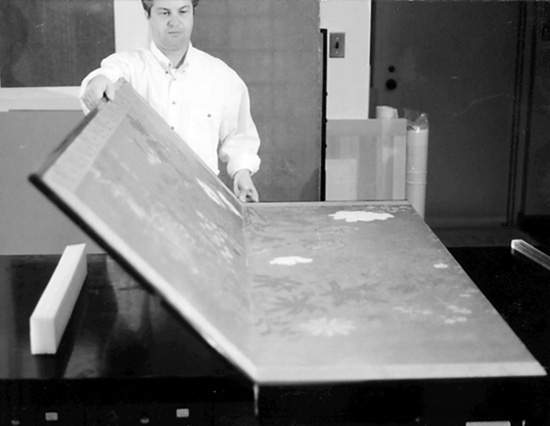 Examine the painting with raking light to see if the silk or paper fragments are becoming detached from the backing paper. The conservators may have to perform emergency treatment before those fragments flake off or disappear. Unsecured fragments may have to be temporarily re-adhered even before photos are taken, if the painting is to be photographed in an upright position. Hanging and hand scrolls are constructed of multiple thin papers fixed with extremely diluted paste, because an excess of wheat-starch paste makes a scroll too stiff. When the layers are especially thick, the inside layer and outside layer have differences in the curve when rolled which causes the separation and de-lamination of the support layer. This also causes creasing. Wheat starch is a stable material, but it does deteriorate and loses its adhesive power. Many conservators now use pure starch paste, but some mounters in Asia still practice with starch paste with gluten or even alum in it. Moisture swells the hardened paste, and temporarily loosens the adhesive power. Moisture also causes separation when the scroll receives mechanical action such as rolling and unrolling. Moisture causes the front support layer and reverse backing layer to suffer from the disproportion in expansion and shrinking. Often mounters rub the reverse of a scroll with rosary beads to make the mounting more flexible. However, the procedure may also cause the layers to separate if done to excess. Blisters or separation of the layers also happen for the same reason. This can be also determined by examination under raking light. Surface coating, which shrinks very much when dry, cracks the surface of the silk or paper support and causes it to lift up or separate from the backing paper layer. Multiple layered papers such as maniai, torinoko and thick Chinese paper sometimes de-laminate, especially when the surface has been heavily coated with dosa (alum/gelatin sizing) or other kinds of adhesives. Support losses occur for two main reasons. One is loss of the primary support which happens when it is separated or de-laminated from the backing support as I have described above. The second is when the primary support is constantly rubbed against the back side of the scroll when it is rolled, which is a form of abrasion. This happens particularly on the areas which are higher than the rest of the surface such as the joints of each part of the scroll. Patches from the back side are another example. Japanese scrolls have rough kozo paper with calcium carbonate in it. Chinese scrolls normally have a smoother or more burnished surface. When the silk support for some Buddhist paintings suffers from abrasion, urahaku or urazaishiki, ( application of gold or pigments from the reverse side of the translucent silk), appear on the front surface. Abrasion of pigment layers also occurs from rubbing against the back side of the scroll. Deterioration of the animal gelatin medium causes the adhesive power to loosen and the paint to flake off or to becomes chalky. Pigment or paint layers which have an animal binding medium often become stiff and less flexible. When a scroll is rolled the paint layers do not curve as easily as the silk or paper support does. Paint layers expand at different rates from the paper or silk support in humid conditions. This happens especially with screen paintings. The support is often rigidly stretched on the panel structure, but the paint layers have a tendency to shrink in a low humidity environment. The artist's technique sometimes causes flaking of paint. Principally, the thicker gelatin medium must be applied as the under layer. Upper layers should be thinner. Modern artists usually do not follow this rule. Surface coatings applied by a previous restorer, such as heavy sizing and consolidation of flaking paint with animal gelatin on the surface of the paint, can cause the surface to shrink and flake off. Unlike current methods of inpainting for oil painting and object conservation, the inpainting materials for scrolls and screens, which are generally the same materials as the original paint, are not reversible on a painting's surface. So it must not be done on the original surface. It should be done only on the losses or fills. Inpainted areas often darken because losses are sometimes sized with heavy concentration of animal gelatin/alum sizing for inpainting. Because of the weight of the scroll, areas near the top rod and bottom rod are very common areas for tears. A majority of cracks are tears of the primary support that have been reinforced by backing paper, as well as old tears that have been mended or supported by backing paper. This can be seen easily with transmitted light. Screens, such as folding screens and sliding screens, are functional architectural devices in Japan. In order to avoid any loosened or sagging surfaces during the rainy season in Japan, the paintings are stretched to the maximum and mounted tightly to the undercore. When the screens are brought to this country, with a dry relative humidity, many are ruptured or torn. Even the hinges of the folding screen shrink and when there is not any give when folded, the paper hinges break. A hanging scroll has no support except the simple top and bottom rods when it is hung for display. Sometimes the front surface shrinks more than the reverse side or vice versa. In other words, when front and reverse have uneven tensions, because of the dryness or high humidity, distortion of the scroll occurs. This can be seen when it is hung. Distortion is also often caused by the mounter's technical mistakes. Sometimes the fibers of the backing paper are over-stretched or not stretched enough for the front layer and back layer. An even tension must be maintained, especially if these different kinds of paper and silk at front and paper at back are applied. It requires technical expertise and experience to produce even tension. Often the narrow side borders for scrolls shrink more because the pasted areas shrink most. The joints are so close to the edges, which are also folded with the paste. These areas have a tendency to shrink more than the rest and this phenomenon can cause overall distortion. The wooden rods at the top and bottom also warp if the wood is not correctly aged. The grain of the wood must be also straight. Distortion of the screen comes from uneven tension between the back side and front side of the panels. There are about ten layers of Japanese paper for each side of each panel, which means twenty layers are applied. The front and back of the panels must have an even tension throughout, or the flexible wooden core structure gets warped or twisted. Corner distortion with screens occurs when the wooden undercore shrinks and the paper layer loses flexibility and fails to shrink along with the undercore. Excess paste from the backing causes the surface to become glossy. When the paste becomes chalky it appears as a whitish powdery surface on the painting. Excess paste also attracts mold growth on the surface. Dosa (alum/gelatin sizing) which restorers often applied to the surface to saturate the colors also becomes chalky when aged and appears as white efflorescence. When the alum is too strong for the color fixative dosa solution, crystals develop on the surface. Many older Chinese and Japanese paintings on silk have overall discoloration or have turned dark. Buddhist paintings which were constantly displayed in temples are also often discolored by candle soot. Many old Chinese paintings and Japanese Buddhist paintings have a dyed, pigmented or colored backing paper applied directly to the back. This not only makes the paintings look darker, but also a certain amount of the dark pigments, dyes and black ink transfers onto the silk support especially when it is applied or removed with water. Backing paper, as well as the primary support, often discolors from contact with malachite and azurite pigments, especially when the paper/silk support is acidic. Decorative back side paper for hand scrolls often causes discoloration of the front side. For example, silver leaf on the back tarnishes and sometimes it causes the discoloration of the paper at the front. Decorative mica on the back also transfers to the front. Folding screens and panel screen paintings often have stains from the undercore of the structure. The wood used for the undercore must be acid or resin free, otherwise the paper gets discolored. This happens especially when the support paper is acidic or contains unstable materials, such as alum/gelatine sized paper or wood pulp contained in Chinese paper. Paste used for filling losses with paper or backing entire pieces sometimes contains gluten. The gluten causes discoloration of the pasted areas. The remounting of Asian paintings uses a great deal of water, and if it is applied unevenly or is splashed by accident, it sometimes makes permanent water rings on both support and pigment areas. Other forms of damage are very common and similar to the deterioration of western paper objects, such as grime, flyspecks, scratches, stains, silverfish foxing and wormholes. This is a basic summary of what conservators should look for in examining Asian paintings. Recognizing the causes of deterioration and keeping proper records with photographic documentation are the first steps toward proper preservation of Asian paintings. Special thanks to Mr. Brian Vogel, Mr. Peter Grilli and Ms. Anne Nishimura Morse for the editorial work, Mr. John Robbe in the photographs and the Department of Asiatic Art, Museum of Fine Arts, Boston for making it possible for me to publish this article.